What happens when the boys accidentally knock a UFO off its course, causing it to crash in their backyard? And what will Phineas, Ferb, Candace, and Isabella do when they meet its pilot, the adorable Meap? 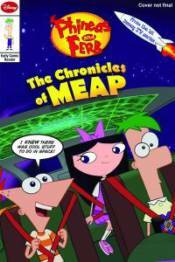 While Candace shows off the cute creature, the others take off in Meap's ship and are captured by Meap's arch rival, the sinister Mitch. It's up to Candace and Meap to defeat Mitch and rescue the three interstellar prisoners!